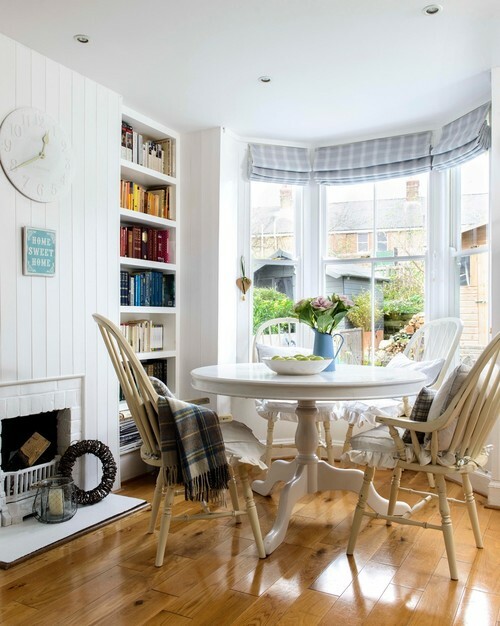 House Hugger: Let's Talk About Kitchens Again! 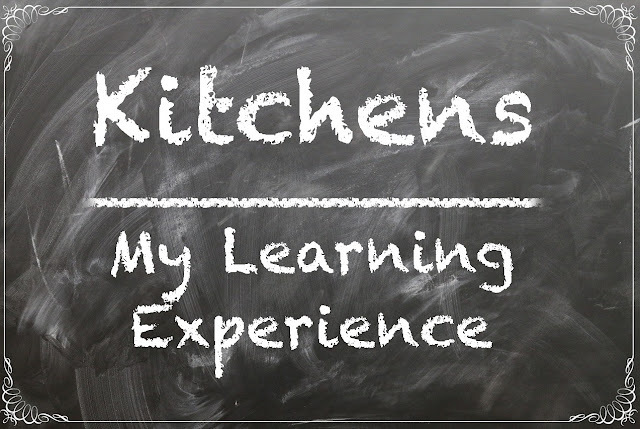 Let's Talk About Kitchens Again! Hey, guys and dolls! Know what time it is? It’s time to talk about kitchens. Again! That’s right, my favorite room in the house. I love my kitchen. I also hate it. I’m funny like that. At this very moment, my kitchen is dissatisfying. I’m being kind. 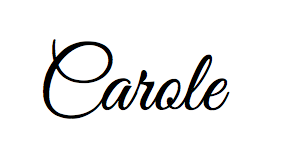 It’s actually awful, and that’s because I didn’t get it right the first time. I thought I was happy when I wrote about it here. But I grew to hate the room. Let’s talk about black granite countertops. They’re so beautiful! At least until you make a sandwich. Add in the fact that I have three cats, and you can see how black granite might be a problem once in a while. I didn’t want black granite. I didn’t want granite at all. But it was on sale. And then there are my cupboards. They’re solid cherry! And I hate them. I know, I know. Some folks are so hard to please. It’s not the cherry that I hate, but the style. They’re ultra contemporary with no design appeal of any kind, in my opinion. My house was built in 1890. You can see the problem with a contemporary design. But the cupboards were gratis from the interior design office where I worked back in the day. If anyone can pass up free, solid cherry kitchen cabinetry, I’d like to meet them. I’m not quite that strong. Now let’s move to the kitchen floor. Mr. V. and I had a great idea. We built the flooring from 2x8 pine boards. And let me tell you, it was gorgeous. At least until we lost our minds and painted it black. Sinner loved it because she could see her reflection. But it didn't hold up well with two dogs and now three cats. Sometimes, we’re not the brightest bulbs in the box. Those things -- the cupboards, countertops and floor -- are anchors in my kitchen. Sadly, my anchors are confused and muddled. They aren’t worth a flip. Neither are my windows, but that’s a whole different story. 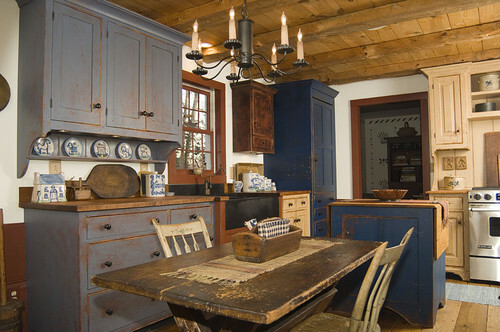 If I could have any kitchen at all, it would have a bohemian/cottage sort of vibe. Some days, I’m in love with white-on-white. And other days, nothing is more appealing to me than rich, warm colors. 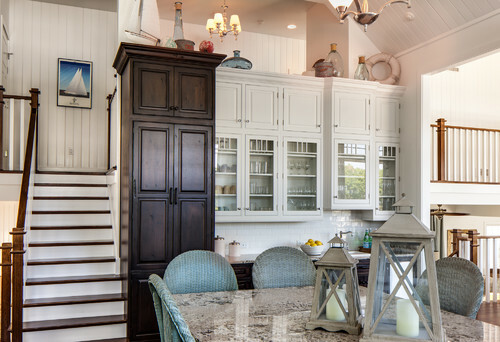 Here are some ideas I’ve found at Houzz that really ring my bell. First, look at this. Just look at it. I wish my staircase led to the kitchen instead of heading straight into my front door. I love the mix of color here, especially the dark stained cupboard against the white and glass. I could live in this room. Think I'm joking? I'd set up a feather bed in front of the hearth and I'd be all set. I really want a fireplace in my kitchen. 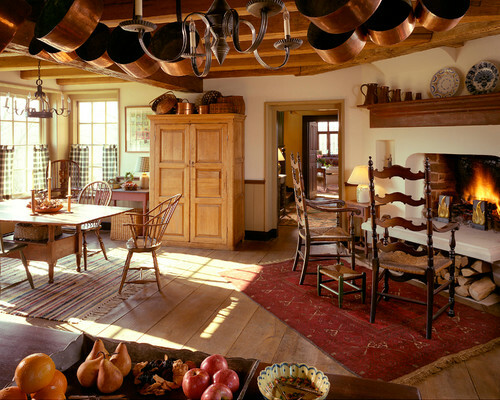 I really want a keeping room, to be honest. I've talked about this room before. There's something about the mix of color and texture here that makes me happy. I'm usually not a fan of turquoise in a kitchen. But this is just lovely. This is a red that I could live with. Not too blue, not too brown, not too orange. 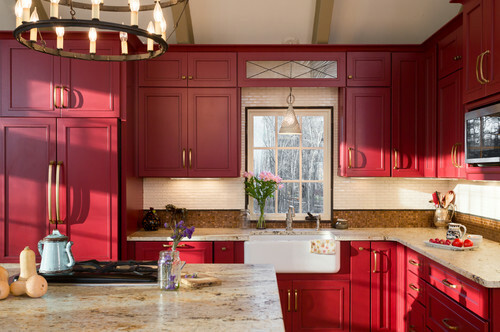 If I trimmed out my existing cupboards to give them more personality, I could paint them barn red and have something similar. One of my first loves, Windsor chairs. I'm not a fan of straight-backed chairs. I like a chair that hugs me. Wood countertops might seem silly. But they're no more vulnerable to burns and scratches than laminate. In some ways, they're better. If there's a mishap, it can be sanded out and refinished. I wouldn't seal the wood with urethane, either. 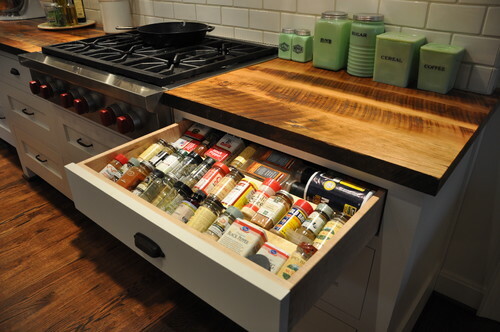 I'd only work a mixture of beeswax and mineral oil into the wood, the same as butcher block countertops get. They'd age, mellow and look better over time. I really love this dinette. I'm not crazy about square or rectangular tables. And I have a strong distaste for kitchen bar/island seating. It looks nice, which is why I built a beautiful island in my kitchen and turned the back side into a bar. But it's not comfortable, which is why I took a sledgehammer to it last summer. Disliking bar seating puts me firmly in the minority, I'm sure. But I'm not overly tall. And the older I get, the less I like having anything in my house feel like a chore. I don't like climbing up to sit down, and I don't like choosing between letting my feet dangle or catching my heels on a chair rung. No, I like my seating at seat level, thankyouverymuch. This space looks comfy and inviting. Extra kudos for the book shelf. Trying to choose a real theme for my kitchen has been more challenging than I thought. Mr. V. and I clash when it comes to style. I want a home that looks warm and lived in. He's not sure what he wants, but he knows what he doesn't like when he sees it. Haha! Hopefully, I'll one day have this old girl the way that I want her. But if I didn't have a project or five ahead of me, I wouldn't know what to do with myself.